World class views will take your breath away! This custom built, modern architectural style home is located in the sought after "Los Feliz Oaks." 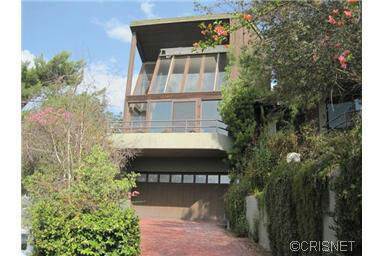 Property boasts City to Ocean views and view of Hollywood sign and Observatory. Interior features include panoramic windows, multi-level open floor plan, recessed lights, high ceilings, and custom tile in the kitchen and baths. Master retreat features walk-in closet, jetted spa tub, steam shower, and separate toilet room with bidet. Additional two bedrooms are located opposite each other with full bath in between. On the main level is the Chef’s kitchen open to the dining area, family room with fireplace, convenient half bath, and separate laundry/utility room. The living room has it's own level featuring a sunken sitting area with second fireplace and opens to the largest balcony. There is an additional alcove level from here. Enjoy the outdoors from multiple balconies and the spacious rear deck which is perfect for entertaining. There is a built-in spa and tranquil views of the Hollywood sign and the Griffith Park Observatory. Paver driveway leads to attached two-car direct access garage. Add your custom finishing touches for the TLC needed. An opportunity like this will not last!